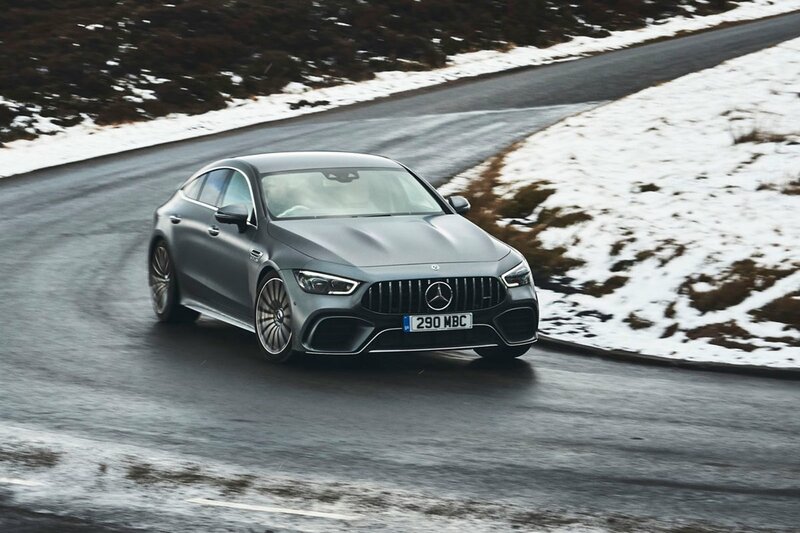 Mercedes-AMG GT 4-door Interior, Sat Nav, Dashboard | What Car? Dominated by twin glossy widescreen displays, the GT 4-door’s interior will, for the most part, remind you of Mercedes’ higher-end saloon cars. Inevitably, that means a slightly chintzy mix of gloss black plastic and drilled chrome materials, and our test car’s bright yellow seatbelts certainly won’t suit everyone’s taste. Thankfully, buyers are given the option of open-pore wood, glossy carbon fibre or matt carbon, all of which look a fair bit classier. And while we’re on the subject of class, the GT’s dashboard is finished in Artico (read man-made) leather as standard. Whilst it’s not truly offensive, it does look a little cheap in such an expensive coupé. Thankfully a quick raid of the options list replaces the Artico with real hide of a much finer grain. Of course, interior style is a matter of taste, but more concerning is how closer inspection reveals a few creaky panels along with trims and stitching that don’t meet up where the door meets the dashboard. Let’s hope that’s down to a few early production cars on the GT’s launch. The driving position is fairly low by saloon car standards – but not as recumbent as that of a true sports car. 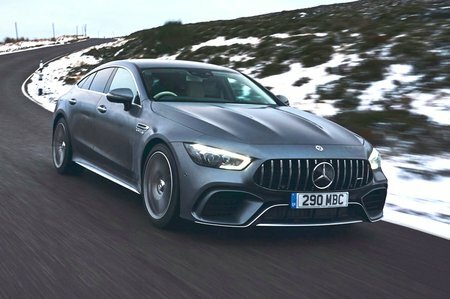 That might be your biggest clue that, under the body panels, this car actually has more in common with Mercedes’ large and medium-sized luxury saloons than the two-door GT. Still, there’s tonnes of adjustment so, whether you’re built like Danny DeVito or Arnold Schwarzenegger, you’ll be able to get comfortable. 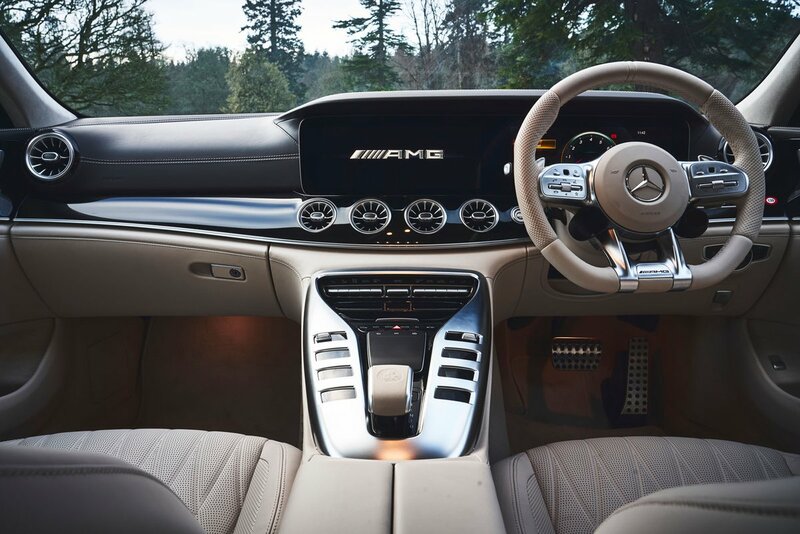 Up front, our test car’s sports seats displayed deeper bolsters than you’ll find in most grand tourers, and they take a little vaulting over. Once you’re in, though, the seats are nice and comfortable, despite being short on lumbar support. What lends the GT 4-door a feel unlike its more humble relatives is an extra-wide centre console whose V-shaped bulk is supposed to echo the size and shape of the V8 engine just beyond it. It manages that trick with questionable success, though, and is more likely to make you wonder how much more spacious the interior would feel if it weren’t there. The console features an array of individual toggle switches and buttons that control the car’s drive modes, air suspension, active exhaust, stability control and more. Each switch or button has its own small display to indicate the state in which you’ve left the corresponding system it controls. They make it easy to flick between the many and various settings by obliging you to look away from the road only briefly – and, crucially, only once – rather than having to reference every adjustment with a second look to the instrument or infotainment screen for confirmation. If that wasn’t handy enough, the steering wheel gets a rotary dial to switch between drive modes and a couple of configurable buttons so you can switch between loads of settings without having to take your palms off the wheel. The infotainment system itself has a 12.3in touchscreen, but can also be controlled by a central touchpad or another on the left hand spoke of the steering wheel. It proves much easier to use than Lexus’ similar system and being able to control it via the steering wheels is handy, if sometimes fiddly, although we still prefer a rotary dial. The menus are pretty easy to navigate and the graphics are high definition.